First Lady Melania Trump unveiled her official platform from the White House’s Rose Garden on May 7, focusing on the welfare of children. The unveiling is significant as it marks the first time Trump has officially laid out her formal policy goals as the first lady. Previously she had worked on combating a range of issues such as cyberbullying, neonatal opioid effects, social inclusion, and internet safety. 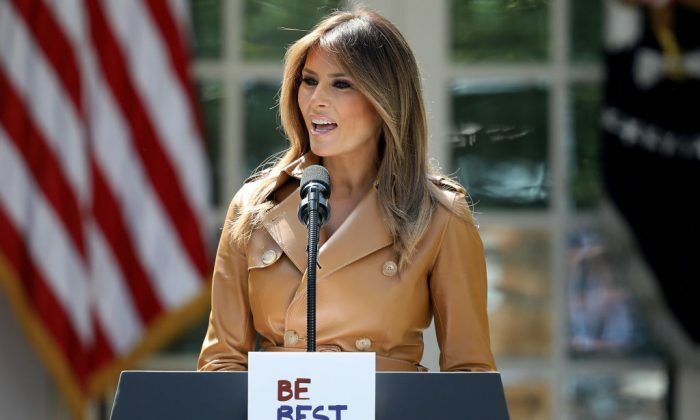 Her campaign, dubbed “Be Best,” will help to combat issues facing children today and will include three main pillars centered on well-being, social media use, and opioid abuse. Her campaign will work to promote the people, organizations, and programs that are helping children overcome these issues. President Donald Trump, also at the event, helped sign a proclamation declaring the day Be Best Day, in honor of the first lady’s new platform. A recent CNN/SSRS poll reflects the president’s comments, showing the first lady has experienced a significant surge in support from both women and Democrats. Fifty-seven percent said they now have a favorable impression of the first lady. We should strive to provide kids with the tools they need to cultivate their social and emotional health. Also joining the first lady in the announcement were children who had written to her and whom she met during her first year. She asked some of them to stand up during her speech, as audiences applauded in return, at the packed event. Melania Trump has always shown interest in helping children. Just last month she turned the Blue Room at the White House into a classroom and invited middle-school students to discuss the thoughts and issues that they face.